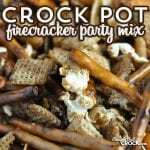 Add a little kick to the party with this delicious Crock Pot Firecracker Party Mix from Gooseberry Patch's Slow Cooker to the Rescue! I used Sir Hamilton, my Hamilton Beach Programmable Insulated Slow Cooker. You can use your favorite 6-quart slow cooker. I know that we usually leave the lid off for party mixes, but this one calls for a little on, little off. It is okay. It'll work!